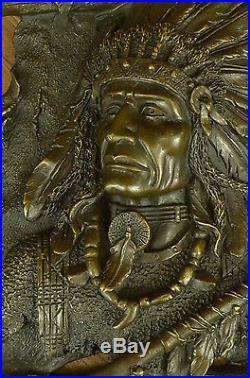 Vintage Indian Chief Original Heavy Bronze Metal Wall Hanging Sign Plaque Figure. This sculpture is in perfect condition. Bronze Dimensions :Height 10" x Width 11" Weight : 8 LBS. 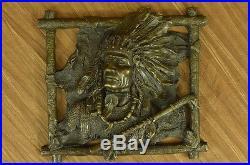 We LOVE this Native American Chief Wall Mount. 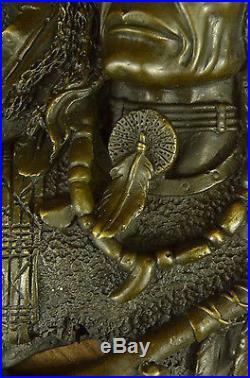 So large, and full of detail in his braids, feathers and head. What a great conversation starter. Sits majestically on any wall. Made out of pure bronze and hand painted in a crisp, clean brown patina. We love the size in depth AND in total. He's heavy, so please use a very strong nail, or dry wall or plaster anchor. He's easy to hang. In the back, there is a key hole, so aim for the nail, and just place the key hole. The process of bringing a bronze sculpture to life using the lost-wax method is something you'll appreciate after taking this tour- Enjoy. The Lost Wax Casting Process. Here Artist original clay sculpture is nearly ready for the foundry. Note the artist is still adding the finishing touches. Most sculptors prefer to work with clay or wax; some however, do use wood and other mediums. Here the finished original clay is now complete. The first step can be shocking for some as they begin to decide how this original will be cut up. The clay plug later serves as a pour spout for the mold. As you can see now they begin painting the latex rubber onto the original together with the clay plus that's been added in layers. Notice the shim line that will alter serve as a separation line for dividing the mold in half. 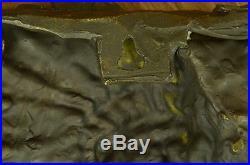 A lock and tab system has been applied (see the edge) so that the mold will be able to be opened and closed securely. Once the rubber mold has been completed, a plaster or fiberglass "mother" mold is applied to the outside which will preserve the integrity of the rubber mold. The "mother" mold is now complete, the next step is to separate the two halves of the mold and remove the original from inside. The next step is to remove the artists' original and reassemble the clean, empty mold. Now a way pattern will be poured by building several layers of the hot wax within the rubber mold. A layer is poured, allowed to dry until there is about a 1/4 inch thick wax pattern made of the artists' original. 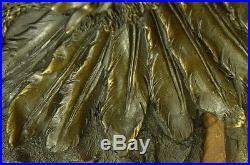 It is very important to note that the wax pattern is a hollow duplicate of the artists' original. Now the wax pattern is taken to the wax "chasing" room of the foundry. Here much time is dedicated to the restoration of the wax pattern to the exact likeness of the artist original. All bubbles and imperfections are "chased" away in this process. Eventually there will need to be a way for the hot, molten bronze to funnel its way into a ceramic type mold, shown here the wax pattern is sprued and mounted on a wax cup. The red spures serve as gates and vents later in the process. Notice the wax trees are then taken to what is known as the slurry room where the time consuming process of building the ceramic shell will begin. First the wax tree is dipped into a slurry tub and coated. The slurry itself is basically made up of colloidal silica. While it is still wet, the tree is coated with the first layer of sand which is made up of fused silica. This process takes about 8 days to complete. Each day it is dipped in slurry and once again coated with the silica sand. The silica sand used goes from very coarse to very fine beginning to end. Eventually the shell will be approximately 1/2 inch thick. The complete, dry shell (remember it still contains the wax pattern inside) is placed in the burnout kiln where the shell is cured and the wax pattern is melted out, hence the term "lost wax". Each time another number in the edition is cast a new wax pattern must be made from the mother mold which is again lost in the process. Now the shell is ready to receive the molten bronze. This is an art in itself and requires years of training to master. No two patinas can turn out exactly alike. It can take anywhere from 8 to 16 weeks for one casting depending how busy a foundry is. In conclusion, remember that as an example if there are going to be 100 bronze casting in the edition, this whole process is done over and over for each number in the edition. They are truly original castings. The only step that can be "re-used" in casting another number in the edition is the "mother mold" in the very beginning. 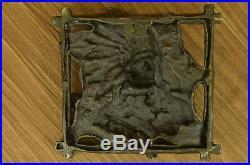 Once all numbers have been cast (the amount of numbers is decided by the artist before casting begins), the mother mold is destroyed. 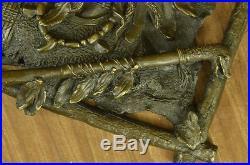 The item "Vintage Indian Chief Original Heavy Bronze Metal Wall Hanging Sign Plaque Figure" is in sale since Wednesday, April 06, 2016. This item is in the category "Art\Art Sculptures". The seller is "european_finery" and is located in Mineola, New York. This item can be shipped worldwide.